Drinking water is temporarily unavailable. Please monitor this page for updates. Due to significant erosion, the parking lot at Stoltz Pool Groupsite is closed. For the 2019 camping season, while BC Parks relocates the parking lot, vehicles will park in the day-use parking lot located approximately 200m (625ft) from the groupsite shelter. Campers and RVs can camp in the day-use parking lot, but will not be permitted to have fires in the parking lot. Due to extremely unstable slopes and increased risk of landslide, the Stoltz Bluffs trail is closed. Please monitor this page for updates. If it’s outdoor recreation you’re after, Cowichan River Provincial Park on southern Vancouver Island is the place to go. Whether you want to go swimming, canoeing, white-water kayaking, tubing, camping, fishing or hiking, or just want to take it easy in the sun, you’re bound to find something to do in this “recreation corridor” south of Duncan. This spectacular park protects significant stretches of the Cowichan River, which is designated as both a BC Heritage River and a Canadian Heritage River, and is internationally renowned for its wild salmon and steelhead fishery. The park is adjacent to an abandoned rail right-of-way, which provides recreation opportunities for cyclists, hikers and horseback riders. While staying at the park, visitors can enjoy other features of Cowichan River Provincial Park. 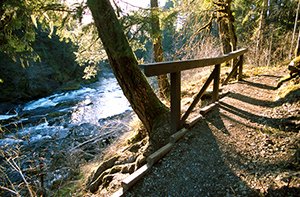 These include the historic 20 km long Cowichan River Footpath and a variety of day-use and picnic areas, each with their own unique features and highlights. Visitors won’t want to miss the sights from the restored 66-Mile and Holt Creek Trestles on the Trans-Canada Trail, which offer spectacular river views and the opportunity to imagine back to a time when log-laden traincars would thunder along these tracks high above the Cowichan River. The Cowichan Fish and Game Association operates a shooting range in Cowichan River Park at 4295 Robertson Road. Park visitors hiking near the Glenora trailhead of the Cowichan River Footpath may hear gunshots during range hours. The shooting range is closed to the public as per its Park Use Permit issued under the Park Act, and operates in accordance with applicable federal regulations. Please stay on authorized trails and follow all signs. Cliffs: Cowichan River Provincial Park contains many areas adjacent to the river with steep drop-offs and overhanging bluffs. Please stay on designated trails and respect signs and railings. River Course: The Cowichan River has fluctuating water levels and swift currents. Children should be accompanied by an adult when in or near the river. Visitors should also expect natural occurrences such as log jams and sweepers at any point and at any time along the river. Large rapids exist at Marie Canyon and Skutz Falls throughout the year. Information on these hazards and pull-out locations are posted at the park. Visitors wishing to swim, kayak, canoe or float tube in this area must familiarize themselves prior to entering the river. Visitors recreating within the park should leave a plan of their intended trip, including which trail or area of the park they plan to use, along with arrival and departure times, with a friend or relative. Skutz Falls Road/West Access: Located off Highway 18, Skutz Falls Road provides access to Skutz Falls day-use area, Horseshoe Bend Group Campsite, Marie Canyon day-use area and the Skutz Falls Trailhead of the Cowichan River Trail. Follow signs from Skutz Falls Road via Cowichan Lake Road and Mayo Road to Riverbottom Road. Highway 18 Connector/Middle Access: Located off Highway 18, the Highway 18 Connector provides access to the Stoltz Pool campground, group campsite and day-use areas. Follow signs to Riverbottom Road. Robertson Road/South East Access: Located on Robertson Road in the Glenora area south of Duncan. To access this point proceed west on Glenora Road, turn right onto Vaux Road and continue down Vaux Road, as it leads into Robertson Road. This provides access to the Glenora Trailhead of the Cowichan River Trail. Canoeing and kayaking are popular in the Stoltz Pool day-use area. Experienced whitewater kayakers may wish to navigate the river between Skutz Falls and Marie Canyon. The river is suitable for year-round kayaking, although the best water conditions are from October through to June. Warning: The Cowichan River has fluctuating water levels and swift currents. Paddlers should also expect natural occurrences such as log jams and sweepers at any point and at any time along the river. Severe rapids exist at Marie Canyon and Skutz Falls throughout the year. Information on these hazards and pull-out locations are posted at the park. Visitors must familiarize themselves prior to entering the river. Bicycles must keep to roadways or the Trans-Canada Trail. Bicycles are not permitted on developed hiking trails. Bicycle helmets are mandatory in British Columbia. This park offers excellent river fishing opportunities. The Cowichan River is a highly important river because of its variety and abundance of fish species, including coho, Chinook and chum salmon, steelhead and Rainbow, Brown and Cutthroat trout. It is one of only two rivers in British Columbia known to have Brown trout, which was introduced from Scotland in the 1930s. Spawning salmon are often easily seen during the fall spawning season at Marie Canyon. All fishing is often closed in this section of the river from October to mid-December; specific fishing closures are posted at information shelters within the park. For up-to-date information, all anglers should check all current and relevant freshwater (non-tidal) sport fishing regulations and saltwater sport fishing regulations, including the appropriate licensing requirements, prior to fishing. A maze of developed and undeveloped routes offers significant walking and hiking opportunities in and around Cowichan River Provincial Park. As emergency aid is not immediately available over much of this trail, please always travel prepared. Basic supplies should include drinking water, a first aid kit and adequate clothing/footwear. Horseback riding is permitted on the Trans-Canada Trail. Pets/domestic animals must be on a leash and under control all times. You are responsible for their behaviour and must dispose of their excrement. Backcountry areas are not suitable for dogs or other pets due to wildlife issues and the potential for problems with bears. Snorkeling and scuba diving in this clear river is becoming more and more popular, as it offers great opportunities for fish viewing. Swimming and tubing are popular activities at the Stoltz Pool day-use area and below Skutz Falls. Warning: The Cowichan River has fluctuating water levels and swift currents. Children should be accompanied by an adult when in or near the river. Visitors should also expect natural occurrences such as log jams and sweepers at any point and at any time along the river. Severe rapids exist at Marie Canyon and Skutz Falls throughout the year. Information on these hazards and pull-out locations are posted at the park. Visitors wishing to swim or float tube in this area must familiarize themselves prior to entering the river. There are no lifeguards at Provincial Parks. River viewing points at Skutz Falls and Marie Canyon are prime locations to watch spawning salmon in the fall, or to have a picnic at the end of a day’s hike. Marie Canyon day-use overlooks the Cowichan River as it surges through a spectacular sheer rock canyon. Skutz Falls offers magnificent views of river rapids and a man-made fish ladder. The restored 66-Mile and Holt Creek railway trestles along the Trans-Canada Trail offer spectacular river views and the opportunity to imagine back to a time when log-laden traincars would thunder along these tracks high above the Cowichan River. At Stoltz Pool, the picnic site overlooks the river from a grassy area nestled in a grove of old big leaf maple trees. The Burma Star Memorial Cairn, a replica of the Kohima Monument in Myamar (Burma) is located here. The cairn was erected by the Burma Star Association to commemorate and tell the story of Major Hoey and the Allied Second World War campaign in East Asia. A boat launch is located at the Stoltz Pool day-use area. Parking is available a short distance from the boat launch. Campfire rings are provided at each campsite. Firewood can be purchased from the park operator. Fees for firewood are set locally and may vary. To preserve vegetation and ground cover, please don’t gather firewood from the area around your campsite or elsewhere in the park. Dead wood is an important habitat element for many plants and animals and it adds organic matter to the soil. You can conserve firewood and air quality by keeping your campfire small. Campfire bans may be implemented. Be prepared to bring a portable stove for cooking. Cold water hand pumps are located at Stoltz Pool campground, Stoltz Pool group site and Horseshoe Bend group site. There is a shelter with a wood stove inside, picnic tables inside and out, and a fire ring. Water is available through a water pump at the site. Beside the shelter is a communal fire pit, surrounded by benches. There us noo field area at this site, but instead there are 16 tent pads with trails leading to each one. There is a gravel parking lot situated between the river and the group site.� Due to recent river bank erosion, the parking lot has limited room for RVs and travel trailers.� If additional RV parking is required, please contact the Park Operator prior to your arrival.� Please be cautious with children, as the river runs alongside the group site area, and can run high and fast during the spring and fall. This site has a shelter and is situated beside Cowichan River amongst the trees. There are 11 tent pads. Parking is in a gravel lot above the site. Vehicles are only allowed to drop off at the shelter and then have to park in the lot. Campers and RVs can camp in the parking lot. The shelter has a sink, wood stoves inside the shelter and picnic tables inside and out. Water is available by a water pump in the group site. Cowichan River is beside the site so watch small children. The river can be dangerous certain times of the year; especially in winter, fall or spring. This is a very private site and beautifully situated. There are four day-use areas at Cowichan River Park: The main day-use area at Stoltz Pool, as well as Skutz Falls, Marie Canyon and 66-Mile trestle. Stoltz Pool day-use: This day-use/picnicking area is located adjacent to the campground and includes a boat launch, riverside trail, picnicking area with tables, parking, pit toilets, information shelter and an all-purpose playing field. The picnic area overlooks the river from a grassy area nestled in a grove of large maple trees. Skutz Falls day-use: Located at the western trailhead for the Cowichan River footpath, this site offers parking, pit toilets, picnic tables, a river pull-out and information shelter. This site provides access to the Skutz Falls section of the river, where visitors can watch view spawning salmon. Marie Canyon day-use: Marie Canyon is a popular sit for picnicking and for viewing one of the more spectacular sections of the river. Facilities include parking, pit toilets, an information shelter and a trail down to the canyon bottom. 66-Mile Trestle day-use: Located near the beautiful 66-Mile trestle on the Trans-Canada Trail, this site offers, parking, pit toilets, picnic tables and an information shelter. There are several pit toilets available throughout the park. Stoltz Pool Campground: There are 39 drive-in and 4 walk-in sites at the Stoltz Pool campsite, situated in a second-growth Douglas fir stand. All sites are well spaced with easy access to the river. Campsite reservations are accepted; first-come, first-served sites are also available. The Stoltz Pool campground is open year-round; a winter camping fee is in place. There are 4 walk-in campsites at the Stoltz Pool campground. Camping is permitted only in designated campsites. The Stoltz Pool day-use/picnicking area is wheelchair accessible. The Stoltz Pool campground is open year-round; a winter camping fee is in place.